French tosafist and Biblical commentator of the thirteenth century. 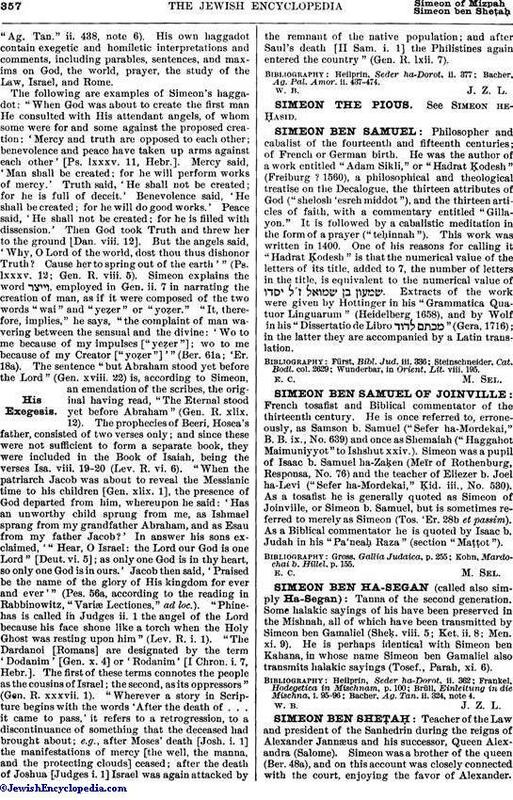 He is once referred to, erroneously, as Samson b. Samuel ("Sefer ha-Mordekai," B. B. ix., No. 639) and once as Shemaiah ("Haggahot Maimuniyyot" to Ishshut xxiv.). Simeon was a pupil of Isaac b. Samuel ha-Zaḳen (Meïr of Rothenburg, Responsa, No. 76) and the teacher of Eliezer b. Joel ha-Levi ("Sefer ha-Mordekai," Ḳid. iii., No. 530). As a tosafist he is generally quoted as Simeon of Joinville, or Simeon b. Samuel, but is sometimes referred to merely as Simeon (Tos. 'Er. 28b et passim). As a Biblical commentator he is quoted by Isaac b. Judah in his "Pa'neaḥ Raza" (section "Maṭṭot"). Kohn, Mardochai b. Hillel, p. 155.